After losing 18 Marines from his unit in an ambush during deployment in Iraq, he returned home only with enough time to focus on his next tour in Afghanistan. While training, Corporal Daniel Hanson injured his back during a time-release propelling exercise. Upon healing from the accident and focusing on the mission at hand, Hanson deployed to Afghanistan and faced more tragedy when he lost a close friend to a rocket-propelled grenade (RPG) attack. Before medically retiring in 2009, Daniel returned to Iraq for his final deployment. After his retirement, Daniel and his family were faced with a rocky transition from the military to civilian life. Between starting a family, his wife Emily going to nursing school, and Daniel undergoing rehabilitation treatment for drugs/alcohol and PTSD and back surgery, the family needed an avenue to de-stress and focus on their family unit in the peace and tranquility the outdoors offers. With his first memories of his childhood revolving around his family’s camping trips, Daniel wished for a pull-behind camper to enjoy the outdoors with his two children and wife without the physical and emotional strain traditional camping has had on him post-injury. 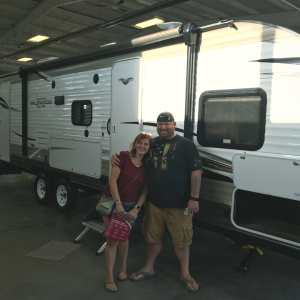 Inspired by his love of his family and our country, the Hanson family received their very own camper in the summer of 2018.